What Every Kid Should Know Before They Are Five! We read a cute book at the library this evening. It’s a picture book which is my favorite type of book. And it’s got lots of good information. It’s called Everything I Need to Know Before I’m Five by Valorie Fisher. I think it’s too late for me because I’m 9. But I do know some of this stuff. Like counting. I can count to 3. And colors. I’m supposed to be color blind, but I can always find my favorite pink tennis ball amongst the yellow ones. My Mom Person says that this is a really colorful book. I guess it is. It does have cute pictures. They aren’t drawings – they’re real pictures, but they’re pictures of toys doing silly things instead of real people, so it’s kind of funny. Like little toy dolls standing on their heads. Or scrubbing giant ladybugs. Other things that Ms Fisher thinks 5 year olds should know are the alphabet, and shapes, and opposites, and the seasons. It’s a really nice book, but it doesn’t have 1 single dog in it! Ms. Fisher has her own blog with lots of stuff about her fun books. You should check it out (http://blog.valoriefisher.com/). I think kids will really like this book even tho there aren’t any dogs. 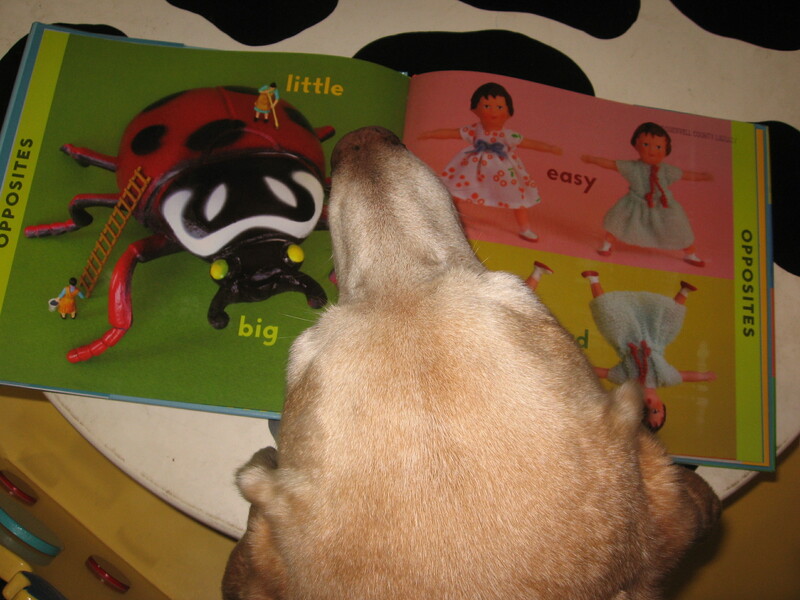 This entry was posted in alphabet books, children's books, libraries, reading dogs and tagged alphabet books, everything I need to know before I'm Five, picture books, Valorie Fisher by readingwithrhythm. Bookmark the permalink. Hi Rhythm! Thank you so much for stopping by my blog today. I’m very glad to meet you! 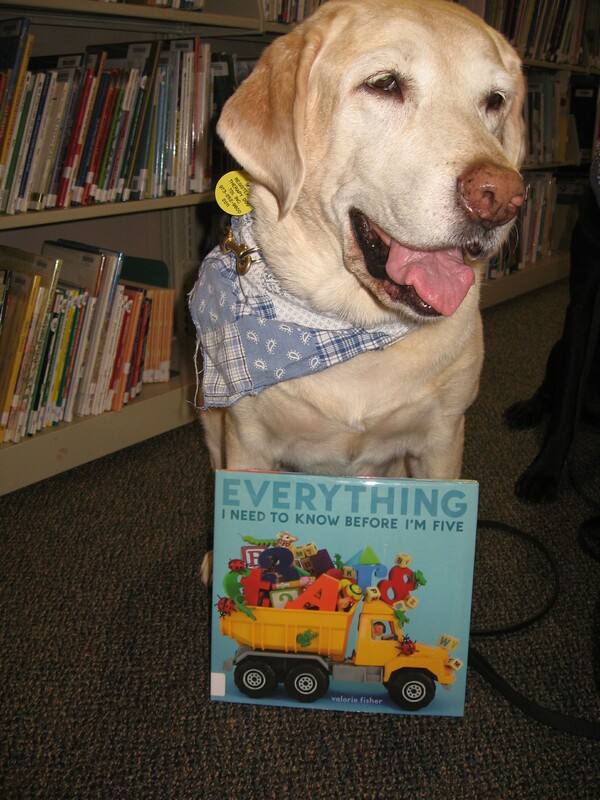 I love that you’re a therapy dog who helps encourage reading – what a great way to approach picture book reviews. I would LOVE to have you join us for Perfect Picture Book Fridays! All the rules/format stuff is posted on the Perfect Picture Book tab of my blog http://susannahill.blogspot.com/p/perfect-picture-books.html (please scroll to the very bottom… which takes a while :)) or you can pretty much just figure it out from looking at one of mine like Mossy which went up today. The main thing is that we try to help parents and teachers expand the use of picture books by giving them specific things they can do with each book, whether it’s activity pages, lesson plans, related books and videos, discussion topics, recipes, art projects, etc.. – something to help bring the book to life and encourage people to read and enjoy picture books. I hope to see you around the blogosphere! Thank you for visiting today. I was really happy to discover your blog. And I’m looking forward to joining you on more PPBFs! 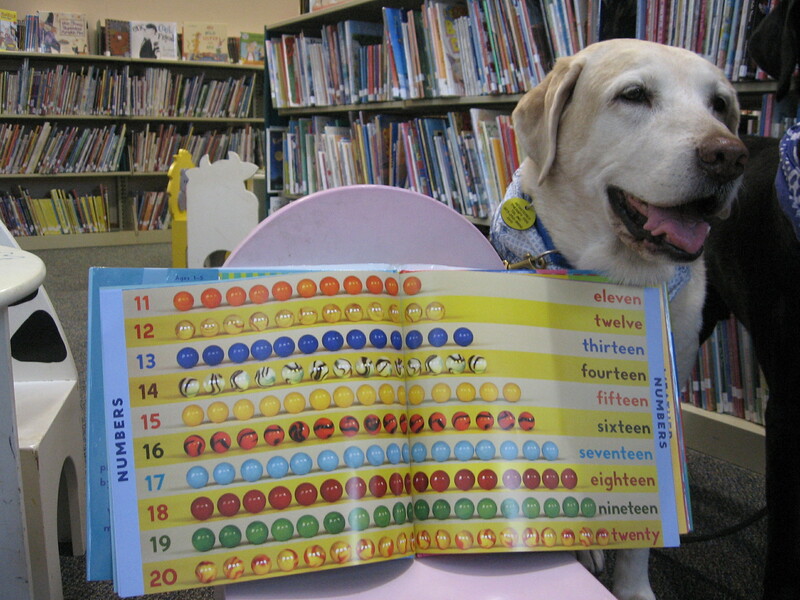 Love the picture of the dog with the book. Very clever. Sounds like fun! Thank you Ms Tilton. We do have a lot of fun! Thank you for visiting! I love being a therapy dog. I sure get to meet alot of great people.